1999 Conservation Ecology 3(2): 15. We demonstrate an approach for integrating social and ecological models to study ecosystem management strategies. We focus on the management of lake eutrophication. 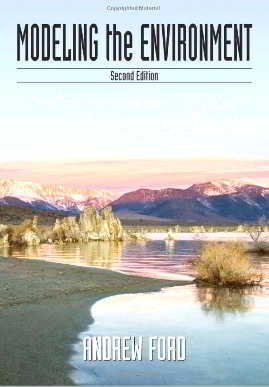 A model has been developed in which the dynamics of the lake, the learning dynamics of society, and the interactions between ecology and society are included. Analyses with the model show that active learning is important to retain the resilience of lakes. Although very low levels of phosphorus in the water will not be reached, active learning reduce the chance of catastrophic high phosphorus levels. Keywords: active learning, eutrophication, integrated modeling, lake dynamics, lake management, multi-agent modeling, phosphorus, resilience, restoration, simulation. 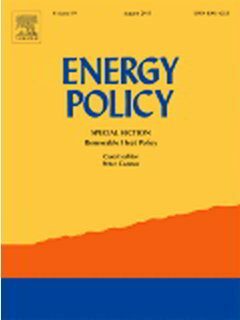 1999 Energy Policy 27(8): 477-494. Many uncertainties and controversies surround the future of the global energy system. The Targets Image Energy (TIME) model of which a concise description is given, is used to explore the consequences of divergent assumptions about some uncertain and controversial issues. The IPCC-IS92a Conventional Wisdom scenario is used as a reference and, in combination with two other scenarios, discussed in the context of other recently published global energy scenarios. Keywords: Global energy scenarios; Energy modelling; Climate change. 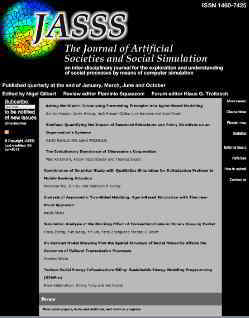 1999 Journal of Artificial Societies and Social Simulation 2(2). Lock-in denotes a phenomenon of monopolistic dominating technologies or consumer goods in a certain market. These lock-ins cannot be explained by superior characteristics of the good or technology. Previous studies mainly used probabilistic models to study lock-in effects. In this paper an integrated conceptual model of consumer behaviour is used to identify relevant processes of lock-in dynamics of consumption patterns. An agent-based model is developed to simulate consumats, artificial consumers, who are confronted with two similar products. We found two types of lock-in, namely, a spatial lock-in and a global level lock-in. The spatial lock-in related to the spatial patterns that occur in consumption patterns and relates to the satisfaction of the need for identity. The global lock-in relates to price effects and occurs only if individual preferences are not significantly weighted in the cognitive processing. Keywords: Lock-in, multi-agent modelling, social psychology, need satisfaction, consumer behavior. 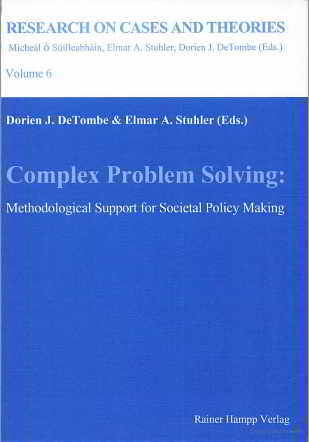 1999 In Complex Problem Solving: Methodological Support for Societal Policy Making, edited by D.J. DeTombe & E.A. Stuhler, pp. 130-139, Rainer Hampp Verlag, Munchen u. Mering. Addressing global change demands an integrative consideration of interactions between humans and the environment on a world wide scale. An assimilative integrated system approach seems to be appropriate for investigation of this complex global problem. In this paper an integrated modeling approach is proposed that is based on an evolutionary view on global change. A case study is worked out where images of the future using a multi-agent model are assessed, and where agents differ in their world view and thus also in their preferred management style. The perspective of agents may change due to new information they derive from the system. A simple model is constructed to illustrate the consequences of this approach on climate change scenarios. 1999 In Validation of Simulation Models, edited by Cor van Dijkum, Dorien DeTombe and Etzel van Kuijk, pp. 45-69, Amsterdam: SISWO. Human activities change the environment on a global level. Global modelling is used to derive insights in the interactions between humans and their environment. However, the possibility to validate those global models is limited. In fact, too little information is available, many subjective assumptions are made and a single model cannot cover all relevant scale levels and processes. These limitations already appeared in the early seventies. Current global modelling activities still deal with the same dilemma’s, often in the same way as the strongly criticised world models of the early seventies. We sketch some recent developments which can help to manage the persistent dilemma’s. We focus on the use of different modelling paradigms and on the use of different world views to analyse the consequences of subjective assumptions to be made in global models. Keywords: global modelling, validation, complexity, uncertainty. 1999 Ecological Economics 31(3); 464-465.